When I was reading the source code of a network system, htons() and ntohs() are the very first two functions that confused me. To understand them, I decided to refresh the fading knowledge learned from college in order to squeeze out the last bit of conceptual doubt in byte order. We are lucky as computer science practitioners since we already understand the smallest unit in cyber space, that is, bit. Thus, we only need to advance towards one direction, up. A bit is simply a 0 or an 1. Physically it is sometimes represented as a tiny magnetic region on a metal plate. Moving up, we have byte that is 8 bits. We generally use byte to measure the sizes of data, like we use meter to measure sizes of objects. So instead of saying “something is 32 bits”, we normally say “it is 4 bytes”. Moving upward, we have word that is 4 bytes (or 32 bits)in 32 bit architecture. Note that I use 32 bit architecture throughout this text to keep it concise, and the concept can be easily ported to 64 bit architectures. 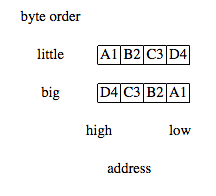 Byte order (also known as, endianness) controls how a word is stored in memory, and how it is transmitted over the network. In big-endian, the most significant byte is set at the lowest address; whilst in little India, some dishes are really hot…no…in little-endian, the most significant byte is set at the highest address. 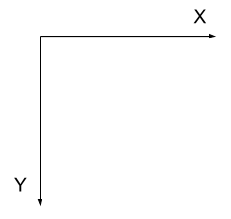 In the above figure, each box — for example, the box containing A1 — represents a byte. Please note that the “endianness shuffling” is based on the unit of byte, not bit. Machines can process the two formats almost equally well, but humans complaint that the numbers in little-endian are reversed. Why? 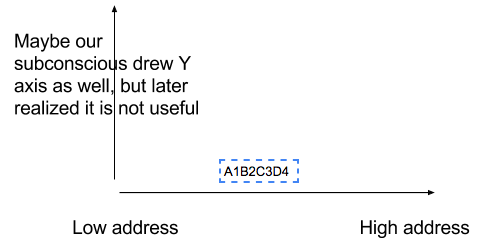 Isn’t it more logical to set the less significant byte to lower address, and more to higher? But if we mandate our subconscious to draw them from right to left, maybe we can reconcile the conflicts between the rationale and intuition. Next we look at how the theories are used, and why they matter, in practice. These two functions fill the format gap between the network and hosts. Technically, when hosts communicate over network, they are used to convert the packet’s byte order. If a host and network byte order are the same (that means they both uses big-endian), the two functions simply do nothing. When a host byte order is different from network (that means the host uses little-endian), htons() converts the data from little-endian to big-endian, and ntohs() converts from big-endian back to little-endian. There are another pair of functions of this kind, htonl() and ntohl() that operate on larger numbers than htons() and ntohs(). They are based on the same principle so I will not further discuss them. I always need concrete code to be sure. As given in the example, htons() changes the original value of anint using big-endian to prepare for network transmission and the original value will be recovered in the receiving host by ntohs(). Though the real network operations are not demonstrated in the example, I think you can get the idea. cpu | grep "Byte Order"